Nearly 500 cycling enthusiasts descended on King Township for a brand new point-to-point cycling event, the Tour de King. 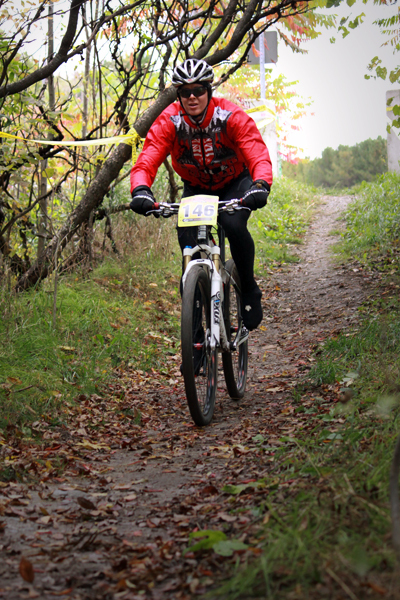 Cyclists got to choose either a more challenging 50 km route, or a 35 km course, taking them from Seneca King Campus through to the finish at Cold Creek Conservation Area. Destined to become a one-day fall classic, the courses featured singletrack trails, scenic road allowances and country roads winding their way through rolling countryside and by many spectacular estate homes. “The Tour de King is designed to be fun and challenging for all types of cyclists. 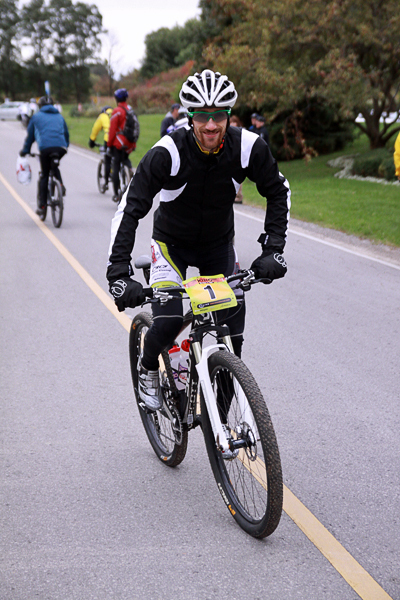 We had some of Canada’s top mountain bikers, lots of first time cycling event participants and everybody in between enjoying the event,” explained Matt Douglas of Chico Racing. Sunday’s weather held off for the start, however mid-way through the event the skies opened up and steady rain began testing many participants’ resolve. Derek Zandstra and Tyson Wagler, both of 3 Rox Racing, led the 50 km race finishing only 2 seconds apart with an unbelievable time of 1 hour and 39 minutes. Zandstra claimed the top step of the podium, while showing everyone why he is one of the best mountain bike racers in the world. In the women’s field Mandy Dreyer took the win with a fabulous time of 1 hour and 56 minutes. Several riders had debated which type of bike would be most suitable for the course – as the race was 50% off-road and 50% on-road. The Tour de King seemed to favour the wider tires and beefier set up of the mountain bikes, however many riders still preferred their European derived cyclocross bikes. In addition to the exciting race highlights Pfaff Audi was the major sponsor of the event. 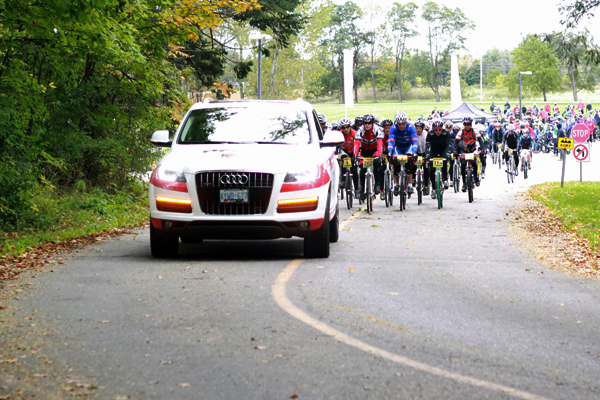 The beautiful Tour de King Audi Q7 set the pace for riders as they wound their way through Seneca College. Other sponsors include Bikesports, Wellington Brewery, Pedal Magazine, Eload, Ontario Cycling Association and Powerbar. The Tour de King has a festival-atmosphere with a great finish line BBQ, a free kid’s race and live music. Thanks to the generous support of the volunteers, course marshals, first aiders, private property owners, Seneca College and the Township of King in helping to make the Tour de King an amazing, and memorable experience.